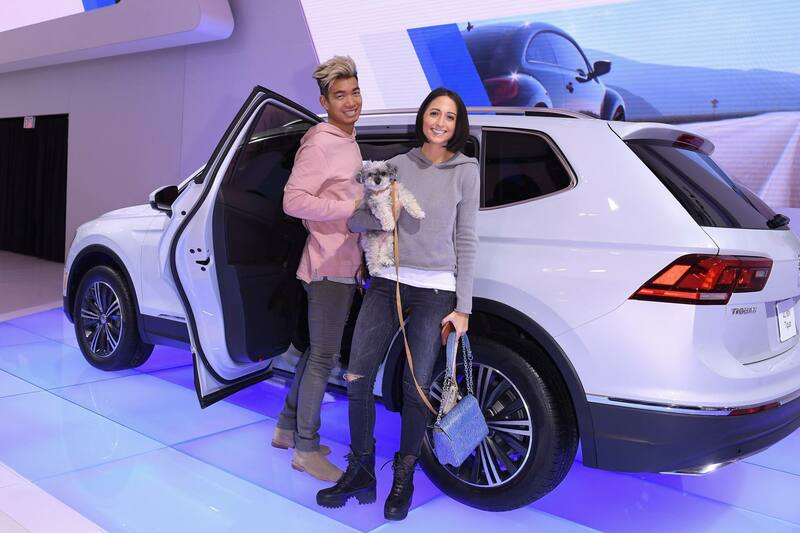 Discovering style at the #VWAutoshow with Volkswagen. Alright, alright. I must admit. I am not an expert when it comes to cars. (Oh, you’re surprised!?!) But, I am an expert when it comes to style. So yeah, I am super picky when it comes to type of vehicle I choose to fit my lifestyle. There is beauty in design, and I’ve always said that when you sit inside a car, its interior, its sounds and the view it gives you of the journey, should all enhance your life, your style and your experience. Style extends way beyond clothes. Style is a way of life. That being said, I was really excited to experience the Canadian International Autoshow with Volkswagen Canada. I’ve always thought of Volkswagen as having superior style. And when I sat in the new 2018 Tiguan Redesign, I could totally see me and my boyfriend, Alex, driving to Prince Edward County in it. Alex loves to off-road (a moment of silence for when we got stuck in the desert last Spring in a sports car, that would’ve never happened with the Tiguan!). And I love to play backseat driver. We also love to take road trips with our dog, Sofia. This year, Volkswagen was able to make magic happen. We got to bring Sofia to the Autoshow! She loved sitting in all the cars, on my lap, pretending like we were going to grandma’s house or driving to Ottawa together (things we do on the regular with our little baby!). The Tiguan Redesign is rugged and spacious – perfect for a couple on-the-go like us! Personally, I’ve always been attracted to vehicles that have more of an off-roading kind of look. This is why I can totally see myself in the 2018 Tiguan Redesign. It’s the crossover of my dreams. Another vehicle we were both super excited about is the 100% electric 2017 e-Golf. The cockpit is fully digital, so if you’re into cutting edge (which we are) this is definitely a game changer. I like the fact that the e-Golf is more environmentally friendly. I think it’s super important to think about these things, as a young(er) person living on earth. I’m so happy there is an electric option for people like me. Which model can you see fitting your lifestyle? Leave me a comment below and let’s chat! This post was sponsored by Volkswagen Canada however the opinions are my own. Next Post My Favourite Faux Fur Coats!